Just click on the link and select the play button. Ummul Fadhl the daughter of al-Harith said that she entered on the Messenger of Allah (SAW) and she said: “Oh! Messenger of Allah, I saw a strange dream last night. He said: And what is it? She said: It was difficult. He said: And what is it? She said: I saw, as if, a piece of your body was severed and was put in my lap! The Messenger of Allah (SAW) said: You saw well – Fatima will give birth, God willing, a boy so he will be in your lap. 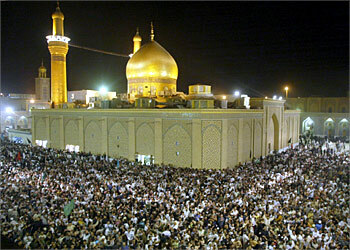 Then Fatima gave birth to al-Hussain and he was in my lap – just as the Messenger of Allah (SAW) said. So I entered one day on the Messenger of Allah (SAW) and put him in his lap, but I noticed that the eyes of the Messenger of Allah (SAW) pouring tears! So I said: Oh! Prophet of Allah, my parents are your ransom, what is with you? He said: Gabriel (AS) came to me and informed me that my nation (ummah) will kill this son of mine.” (al-Mustadrak al-Sahih, al-Hafidh al-Hakim al-Nisapouri, v. 3, p. 176, (al-Hakim said: “This is an authentic hadith (Sahih) on the conditions of Bukhari and Muslim but they did not print it”); Dalael al-Nubouwa, al-Hafidh al-Bayhaqi under the subject of al-Hussain (AS); Cf. Ibn al-A’tham IV, (Hyderabad, 1971), p. 211-2, the author narrates this hadith using a different chain of narration). 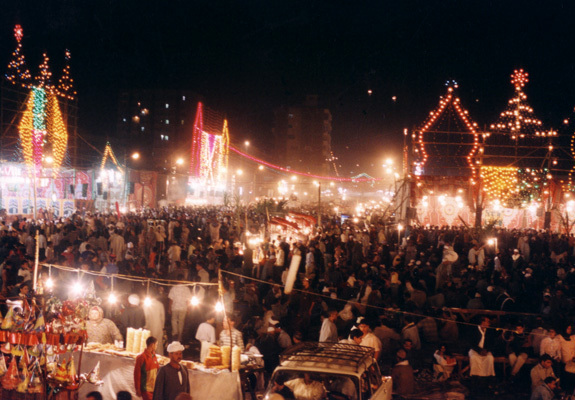 The beginning of the celebration of the Meelad Shareef in its present form lies with the ruler of Irbil, Sultan Muzaffar whose full name is Abu Said Kukabri Ibn Zain al-Din Ali Ibn Baktagin, who is counted among the great Sultans and generous leaders. He was responsible for many other noble works as well. Among the many monuments set up by him was the Jami Muzaffari, which he had constructed near Mount Tasiyun. Ibn Kathir (radi Allahu anhu) writes about Sultan Muzaffar as follows: “Sultan Muzaffar used to arrange the celebration of the Meelad Shareef with due honour, glory, dignity and grandeur. In this connection, he used to organise a magnificent festival. He was a pure-hearted, brave and wise Alim and a just ruler. May Allah shower His Mercy on him and grant him an exalted status. Sheikh Abu al-Khattab Ibn Dhiyah also wrote a book for him on the Meelad Shareef entitled ‘al-Tanwir fi Mawlid al-Bashir al-Nadhir’ (Enlightenment on the Birthday of the Bearer of Good News, the Warner). 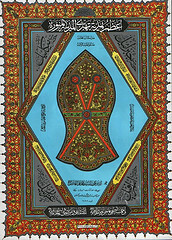 For this book Sultan Muzaffar awarded him a gift of one thousand dinars. Sultan Muzaffar remained the ruler until his death, which occurred in 630 A.H. in the city of ‘Akka when he had the Europeans under siege. In short he was a man of piety and noble disposition”. The sensitive issue of whether or not Muslims can say the words ‘Ya Rasool Allah’ or ‘Ya Muhammad!’ [May Allah bless him and grant him peace] needs to be clarified, since this issue divides the Muslim community and causes a great deal of friction among the Muslims throughout the world. Basically, there appears to be what we could label as two “schools of thought”. One insists that saying that stating “Ya Rasul Allah is ‘shirk’ and that any Muslim proclaiming it in fact goes outside the pale of Islam. Now the other School believes that it is indeed permissible to say so – based on evidences from the Salaf, and the tafsirs of later day scholars. However, they do not insist that one must proclaim this – or that it is even a fard to do so, rather, it is permissible to do so. This is, and always has been, the stance of the Ahl al-Sunna. Does Rasool’Allah (Sallalahu Alaihi Wassalam) have a shadow? Allahumma Sulay Ala Suyedena Muhammadin Fi Aauwali Kalamina. Allahumma Sulay Ala Suyedena Muhammadin Fi Aausati Kalamina. Allahumma Sulay Ala Suyedena Muhammadin Fi Aakhary Kalamina. More than 500 people injured as South Asian nation reels from attacks targeting churches and hotels across the country. Wa Lone and Kyaw Soe Oo were arrested in 2017 while working on investigation into killing of 10 Rohingya.